A Liberal's Libretto: "There's already enough hate in this world..."
"There's already enough hate in this world..."
Ladies and Gents - I'm steering away from the usual "libretto" fodder and moving a little more toward the "liberal" in this post. But, don't be scared. The Health Care Reform legislation is now law and I, for one, am thankful. While it is not the bill that I would have liked to have seen - it is a step. There is more work to be done for certain - but, we are indeed on the right track. Unfortunately, the debate that swirled around this legislation went from bad to worse to absolutely hateful. When I was a child, my grandmother used to forbid me from using the word 'hate'. If I said, "Grandma, I hate eggs" the response was always the same: "You don't hate them - you dislike them. There's already enough hate in this world without you adding to it." That was never more evident than it was over the weekend. On Sunday the Tea Party Protesters who were gathered at the U.S. Capital called Civil Rights pioneer, Rep. John Lewis (D-Ga.) a "ni**er", yelled "FA**OT" in deliberately lisp-y screams at Rep. Barney Frank (D-Mass.) and SPAT ... they actually SPAT ... on Rep. Emanuel Cleaver (D-Mo.). 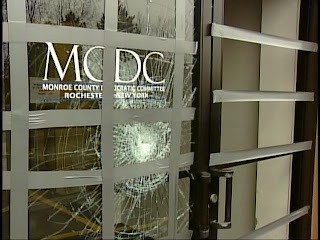 Meanwhile, in New York - the Democratic headquarters in Rochester was violently targeted having had a window broken - it was unclear whether or not the window was shot at or broken with a blunt object. Also targeted in New York was the office of Rep. Louise Slaughter (D-NY.). The same day a brick shattered a window of her Niagara Falls office, Rep. Slaughter says her staff discovered an assassination threat aimed at her family members. “I’m advocating broken windows. I’m advocating vandalism," says Mike Vanderboegh. We spoke to him by phone from his home in Pinson, Alabama. Vanderboegh ... says his invitation to “break windows…break them now” is behind the incident in Rochester and at least two others in Tucson and Kansas. The message to Democrats should be clear. Congresswoman Louise Slaughter has a different take...“I think it says the misinformation that people were given has worried them to a frenzy. They're worried about their jobs and their health insurance and to have this perpetual whipping up of untruths has been very bad," she said by phone from Washington. Slaughter has been at the center of the push for reform. Last Thursday she received a chilling recorded message at her campaign office. “Assassinate is the word they used…toward the children of lawmakers who voted yes." Then, there are the members of congress from the GOP ... the party of "YOU LIE". These nut jobs can now add angry tirades of "HELL NO!" & "BABY KILLER!" to their record. Such gentlemen, right? And finally we come to the Conservative blogger [not pictured] who was apparently so enraged by the impending passage of the health care reform bill that he used his Twitter account to call for the assassination of the president, while also tweeting that since the country survived the assassinations of Lincoln and Kennedy, "we'll surely get over" this one, too. He later recanted his remarks by saying: "I have no intent, desire or motivation to harm the POTUS," he told DailyFinance by email, "I can't imagine why you're interested in my recent tweets." Seriously? "I can't imagine why you're interested in my recent tweets."?!?! That's just plain stupidity. It's so dumb, in fact, that I can't even bring myself to link to his blog. This is no longer about Health Care Reform, Friends. This is hate for hate's sake. It's vile. It's distasteful. It's disrespectful. It's childish and utterly immature. By the way, I thought this was 2010 - not 1910. 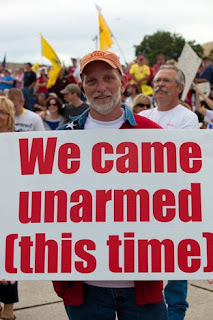 Yet many on the Right - the GOP, Rush Limbaugh, the Tea Baggers, Sarah Palin and Fox News, just to name a few - are advocating this. If not in word, certainly by their silence. They claim they're standing up for the "majority of Americans" in advocating this hatred through their silence and inaction. To me, they're doing nothing more than perpetuating filth, disgust, rancor, hostility, violence and pure repugnance. Shame on every last one of them. Now, let's cut to Keith Olbermann of MSNBC who has spent quite a bit of time with our health care system lately. Last night, K.O. returned to Countdown after having been absent to tend to his father Theodore, who died on March 13 after a long illness and hospitalization. K.O. came back with gusto and in true K.O. fashion - he gave us a Special Comment. His comment is in regards to the passage of health care reform in the house, warning the Republican party that it is paving the way to its own destruction. Give it a look see - you'll not be disappointed.